When I started my company I never thought I’d be doing business coaching… after all, I had been out of the work force for 15 years and I knew nothing of the recent practices of business. However, as I built my family coaching practice, business owners approached me, curious to find out what I was doing and wondering if I could help them get additional leads and grow their business, so they could have a more balanced lifestyle. At first, I provided advice without charging, but eventually I saw my value in the marketplace and could easily recognize that not only had I caught up with current marketing trends, but I had surpassed mainstream business practices that offered results. The most exciting part about all this is I used many of the same principles I used in family coaching and that’s why it worked!! In essence, I see business as a larger version of family and those who adapt my practices see significant growth, while they build a fulfilled lifestyle. You see… my work with families has given me significant skills to manage large groups of people and successfully get the best performance out of each person. Today, business coaching is 60% of my income and I’m thrilled to help family conscious business owners grow their business, make more money and do it all while they make their family a priority. 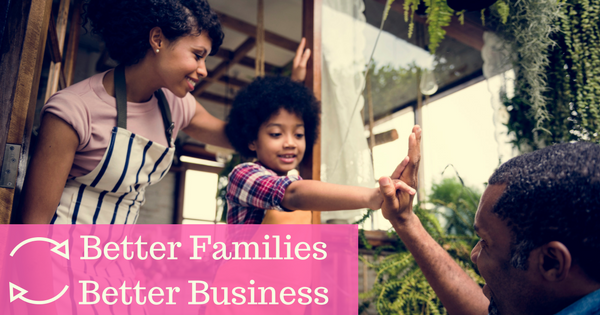 I was recently interviewed by Deb Johnstone for the Elevating Entrepreneurs Summit and we discussed why building a better family will build you a better business. If you own your own business, you definitely want to watch it and if you don’t own your business, you’ll be equally inspired to recognize the patterns that make family and business work. If you want to have a thriving family and business and would like to work with me, schedule a 1-1 discovery call here.